The Double Under has been popularised through Crossfit, but of course it’s been around a lot longer. As long as top athletes and fighters have been using jump ropes in their training—which has been for a long time—they’ve been mixing single jumps with doubles. If you’re swinging your arms like two windmills, there’s no way you’ll be able to get the rope around twice per jump. The key is learning to move the rope more efficiently. It’s all in the wrist. Start off with the single bounce (one jump per revolution of the rope) to get comfortable. A quick flick of the wrist should be all you need to keep things moving for single jumps. Once you’ve got that down, try flicking faster and developing consistent swing timing. Trying to overcompensate for a slow wrist movement by jumping high won’t work for beginners, so be sure to get a fast flick down before experimenting with your jump height. 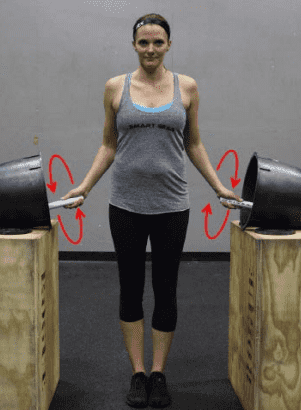 Position a 5-gallon bucket on each side of the athlete. Each bucket should be on its side and propped up on boxes to sit at waist level. The athlete holds a 2-foot PVC pipe in each hand and tries to paint the insides of the buckets in a smooth, continuous movement using only the wrists. Position the boxes and buckets to create correct posture, and ensure the end of the PVC is just touching the inside of the bucket. It’s surprisingly difficult to make a smooth, round shape. People will start going ‘clank, clank, clank, clank’ as they bang the stick into the bucket, Newman states. The goal is to relax and release your wrist, letting the stick make a full circle. Shooting your legs out into a pike position or “dolphin kick” may seem as though it will earn you some extra time to swing the rope around. In reality though, you’ll land heavier and take more time to recover and rebound into your next jump. Keep your legs right under you in the air so they’re prepared to rebound as quickly as possible after landing on the balls of your feet. And keep in mind: Upon landing, your knees should bend a tad to absorb shock. 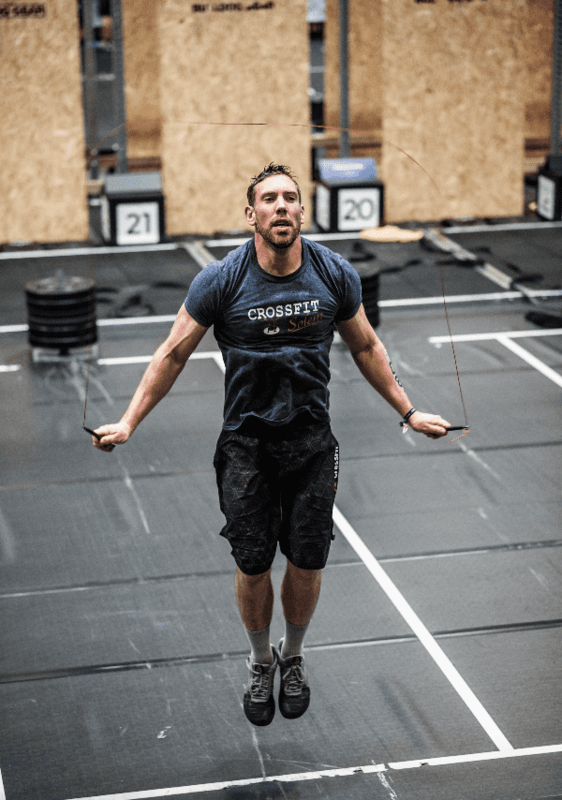 Double-Unders are all about accuracy and cadence. The timing that you should be saying in your head is “Tick – Jump”. The rope hits the ground on the word “Tick” and then you leave the ground as you say “Jump”. The two are close together and it is a quick “Tick-Jump” almost as it is one word. It works with both Double Unders and Single Unders. You should be loading up your jump, just before you snap that wrist downwards. Once you snap the wrist and thumb down, you should be already in a position to quickly jump. A common fault is people jumping too early. They get a few Double Unders, but can’t seem to get past 5, and this is because their timing is a little bit off and eventually it catches up with them as it compounds over the revolutions of the rope. Kicking your feet back, or “donkey kicking,” is a pretty common mistake. It’s a function of trying to jump high enough to get the rope through twice. It also forces people to use longer ropes. It is the most known problem and has the same fix as the Dolphin Kick (Nr.3) as its all about your upright stance and jump. Do you have any tricks and tips that work for you? Leave a comment below as it’s always interesting to learn about new ideas.